Deep water culture is a special and distinct system for growing plants indoors. DWC systems involve the roots of plants being deeply suspended in a solution. This solution must be well- oxygenated to support the plants. It also consists of water and special nutrients to keep the plants healthy. The mixture has 3 important parts. What Does Malnutrition Mean in DWC Systems? This is an essential element in the solution. Because of this element, it's like you're watering your plants permanently. And that's why growing with DWC hydroponics is favorable. Since you submerge the plant roots in water, you don't have to water them ever again. In more traditional planting, most of the nutrients come from the soil. It's the main source of all the essential nutrients plants need to flourish. Because there is no soil in DWC, the water contains all the nutrients. These nutrients supplement the water to keep your plants healthy. This is another important element so your plants can grow well. The water in the system has to be well-oxygenated. This is vital so your plants won't drown. You achieve this with air pumps and air stones. There are two main reasons why DWC systems are so unique. The first reason is that you grow plants in a container which is able to hold a good quantity of water. The more water you have, the more stable the nutrient solution is. So you don't have to keep on maintaining and monitoring your plants. The other reason is that you are soaking the roots of the plants in water. You submerge a majority of your plant's roots in water all day, every day. That's why it's called deep water culture! Knowing what deep water culture is will help you out a lot. Now let's discuss the different types of DWC systems. Here we will go through the 3 types and what they are about. We've also listed down the pros and cons of each system to help you make a smarter choice. In this system, you have a plastic bucket which holds up to 5 gallons of water. The plant grows in a net pot lid which is detachable. It's also packed with LECA stone. The roots of the plant hang downward and out of the net pot. Perching the roots in water and fertilizer mixture provides the needed nutrients. The water is continuously moved around by air coming from an air stone. This air stone is at the very bottom of the bucket and it's attached to a pump. This type of system is similar to a traditional one with an extra feature. In this system, the plant receives oxygen and nutrients too. Aside from that, the plant is also fed by a drip system at the top. All these processes happen at the same time. Water from the tank is pumped to the top. Once it reaches the top, it drips down again, nourishing the plant and its roots. In this system, the water just circulates constantly. It goes to the top then drips back down into the tank with the water. Fairly cheap but very effective. Replacement parts are available locally. Allow rapid rate of growth for younger plants. Plant roots are liable to disease. Maintaining it entails much effort.As your plants grow bigger, EC and pH may fluctuate. Contains more parts than traditional systems. With this type of DWC hydroponics system, the reservoir is separate. This allows for a greater quantity of water and fertilizer to support the plant. The quantity of water and fertilizer is greater in relation to the plant's mass. Because of this, the system is more stable. You won't have to worry about EC and pH fluctuating as much. This type of system is frequently utilized with a number of reservoirs. All the reservoirs are linked together and are all attached to the main reservoir. This allows you to grow more plants in just one system. With the recirculating system, each and every plant gets enough nutrients. Checking and maintaining each plant is easier. EC, pH, and temperature of the water don't fluctuate as much. More expensive to put up. Plant's roots are prone to disease. Have the most parts among all the different types. This is one of the most well-known crops in the entire world. That makes it an ideal choice to grow in a DWC farm. This plant grows easily in any kind of farm. Lettuce has a quick cycle for growth and a high demand in the market. There are a lot of lettuce varieties to choose from. It's a great choice for people who are DWC beginners. Kale has become popular nowadays. This is because it's considered to be a superfood which has a lot of health benefits. It's another easy plant to grow, even through DWC. This plant grows better in cooler temperatures. You can either harvest kale completely or by taking a percentage of the plant at one time. This is another green vegetable which is in high demand. It's fairly easy to grow but you have to watch out for mildew. This French green is more prone to mildew than other kinds of crops. When you see mildew emerging, you take care of it immediately. Once harvested (whether fully or partially), you can enjoy the delectable leaves. This is a well-known Chinese cabbage which will grow well in DWC. There are many varieties of Bok Choy so make sure to choose the right one when you buy the seeds. It's a heavy crop which means the rafts in your system have to be sturdy enough. Because of this, it's recommended to avoid overloading your system with too much of this plant. Among all the plants on this list, basil requires the most effort. This is a distinct plant because you can change its growth direction by clipping some stems. When you clip the right stems, you'll end up with a bushier plant. When your plant is bushier, it means you also enjoy a better yield. This is a great plant to grow via DWC for commercial purposes. It's especially significant for restaurant owners to get a continuous supply of basil for dishes. Collard greens are cheap to grow and they're very healthy and delicious. The easiest collard greens to grow in such systems are broccoli and cabbage. That's because these plants are durable and heavy. Because of this, they will need a good amount of space on your system to survive. This lovely and tasty vegetable is healthy too. Before planting okra seeds, you need to soak them first. Do this for a few hours for best results. It's easy to grow in DWC and can even serve as an ornament. That's because okra plants flowers beautifully. This is a distinct crop which isn't well-known. It's similar to collard greens in terms of the season it grows the best. These seasons are in autumn and winter when the climate is cooler. But growing sorrel through DWC will allow you to grow this crop anytime. It's a beautiful flowering plant which can be added to a lot of dishes. When it comes to nutrients and additives in DWC, those with an increased solubility are best. Pure synthetics which mix with water are the best choice to add to the solution. It's especially useful to add in the formulations which have proportionate mineral ratios. If these formulations are molecularly well-balanced, that makes it better too. With these kinds of formulations, the pH level of the solution becomes more stable. When this happens, the solution stays usable for a longer time. When the nutrients are mineral based, they will work well with your DWC operation. Search for a brand which is already well established. Look at the mineral ratios of the nutrients of the formula. Make sure there are well-balanced ratios. Also, make sure that they're created for DWC hydroponics application. Nutrients which are easily absorbed promote the stability of pH levels. These kinds of solutions can last for 2-3 weeks. The viability of the solution depends on the mass of your plants as well as the size of your nutrient reservoir. If the reservoir is already lacking solution, you can top it with a half-strength nutrient mixture. Do this instead of mixing up a whole new batch. However, you should also check for any fluctuations in the pH levels. Also, make sure that your solution doesn't become murky. If either of these happens then you may have to change the whole solution. You've probably heard the phrase "size matters" a lot. Because of this famous phrase, people believe that the more product you use, the better it is. But this doesn't apply to DWC because there is a danger or over-fertilizing your plants. This is not an effective way to grow plants using the DWC method. Using too little nourishment is also harmful to your plants. With DWC, you have to find the right balance. The signs of malnutrition in plants vary. These variations depend on which nutrients the plants are deficient in. With nutrient deficiencies, it's difficult to spot the effects early on. This is because the plants may be getting enough of one nutrient but not enough of another. When this happens, the plant looks healthy but it actually isn't. As time goes by, the deficiency becomes worse and you will only see the effects in the advanced stages. These show symptoms of deficiency in older plants. This is because they penetrate right through the plant. The new growths need the nutrients so they go straight to those parts. Some mobile nutrients are phosphorus, potassium, nitrogen, and magnesium. Plants absorb the immobile nutrients and take them to where they are most needed. Once there, they stay in that place for an indefinite period. That's why symptoms of deficiency of immobile nutrients show in newer growths. Even if the new growths need the nutrients, they don't travel to these growths. Some immobile nutrients are iron, calcium, and sulfur. The instability of pH is a major cause of concern in the DWC method. Mineral ratios in nutrient solutions on the market have already been carefully calculated. Using lesser amounts than what's recommended, compromises the buffer capacity. This causes the instability of pH levels, leading to plant malnutrition. Fortunately, this problem has an easy solution. All you have to do is increase the dosage. Following the manufacturer's recommendation will ascertain that the plants are well-nourished. Underfeeding your plants is dangerous so it's important not to go overboard with this. But the "less is more" notion does have a place in deep water culture. That's because this method provides a unique growing environment for plants. With this method, the exchange of ions is easy. Because the plants in DWC get more oxygen, they absorb more nutrients too. The plant's roots get the oxygen from different sources. These sources are air pumps and stones as well as ozone injections. If you want to grow big plants, you can push them to high uptake. Just be careful not to overfeed the plants. As soon as you see even the smallest sign of a downward curling of leaves, stop fertilizing the plant. This is when "less is more" becomes applicable. Lessen your fertilization and allow the plants to function by themselves. By now you've already learned a lot of helpful information about DWC systems. It's actually quite easy to build your own system from home. The materials needed for building a system are easy to acquire and readily available. These materials are ideal for building a system for medium-sized plants. 1. If you're using a pot for the plant, add more holes to it. You can do this with a soldering iron or a drill. 2. Take the lid of the bucket and cut a hole in it. Make it as big as the basket or the pot you will use for your plant. When you've cut out the hole, check if the basket/pot fits into it. 3. If your bucket is dark-colored, you can pass this step. But if light goes through your bucket, then you have to paint it. Use the black spray paint to coat the outside of your bucket. The black paint will absorb heat to keep the inside cool. 4. When the black paint dries, use the white spray paint to coat the outside of the bucket. The white paint reflects light and heat. It also prevents light from getting into the bucket. 5. Cut out a tiny notch on the side of your painted bucket. Do this near the top since this is where you'll run your air line. 6. Attach the air stone/s to the air lines then put them in the very bottom of your bucket. Plug in the pump and place the lid on your bucket. Carefully insert the basket/pot in the hole you made on the lid. 7. Pour water into the bucket. The bottom of the basket/pot should be 3/4 inch submerged in water. Draw a line with a marker on the right water level. This will serve as your water indicator when you have a plant growing in your system. 8. Add in the nutrient solution to the water. Make sure to follow the directions on the package. Also, make sure that the solution is for DWC plants. Mix the water and the nutrient solution well and check the pH level. 9. Take the growing media and fill your basket/pot with it. Once that's done, add in your plant or seedling. Making a DWC system is as simple as that. You just need the right tools and materials to build your own structure from home. But if you don't want to put too much effort into making the system, then you can buy your own. In the next section, we will discuss the 2 of the best products in the market. Now that you know more about DWC systems, it's time to look at some excellent products. These 2 DWC grow kits are the best ones in the market now. We've reviewed them both to make it easier for you to decide. Read on to learn about these amazing products. The Indoor Hydroponics Grower Kit by Panthanor is a complete system in itself. The main parts are the planting basket and the cover of the basin. It's great at inhibiting algae from getting into the buckets. This keeps your plants growing at a healthy rate. The basin has a versatile chug cylinder. It produces air bubbles and carries the nutrient solution to your plants. It's a high-quality product which allows you to grow or clone different plants. With this kit, you can work with seeds, cuttings, and smaller plants. It's also made with eco-friendly materials. This grower kit allows you to grow a lot of cuttings or little plants. This kit lets you grow plants a lot faster than growing plants in soil. This depends on the kind of plant grown and the nutrient solution used. The seed starter in this kit is ideal for indoor or outdoor use. The planting basket and basin cover of the kit consists of special materials. It also comes with a buoy which shows you the level of the nutrient solution. This helps prompt you to pour in more water or solution. With this system, your plants will be able to receive a greater amount of oxygen. This contributes to quicker and improved growth. Comes with a multipurpose chug cylinder. It has the ability to transport the nutrients to your plants. It also has the ability to create air bubbles. This cultivates the oxygen to keep your plants vibrant. It also comes with a cloner which clones your cuttings. This makes for a better and more cost-effective growing encounter. 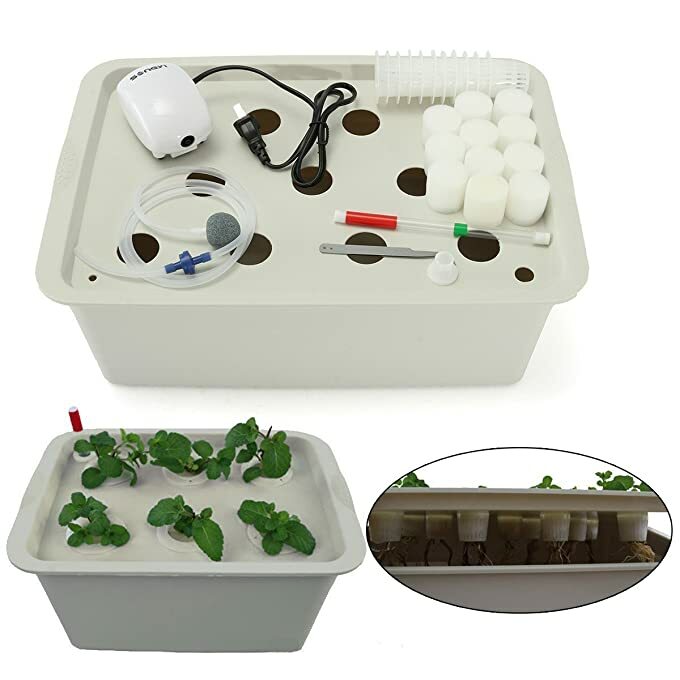 The kit comes with all the necessary parts which are needed for hydroponic growing. It's a superior product which allows you to clone, propagate and garden. It also allows you to perform transplanting indoors and lab hydroponics. Makes noise when the water is being circulated. Doesn't come with detailed instructions for use. 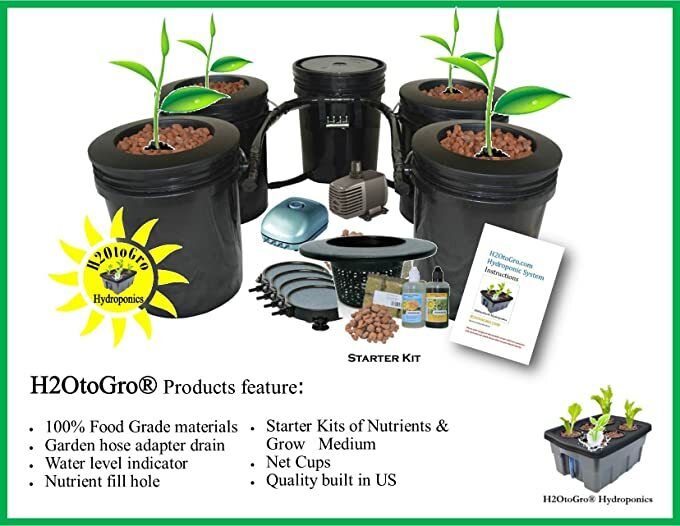 This hydroponic bucket kit is an excellent way for you to create a deep water culture system for your plants. With this kit, you can grow and cultivate plants efficiently. The bucket and the lid allow you to have an easy plant growing experience. Aside from being easy to operate, this product is also affordable. You will be able to grow plants quickly with minimal effort. This Deep Water Culture Hydroponic Bucket Kit comes with all the equipment you need. 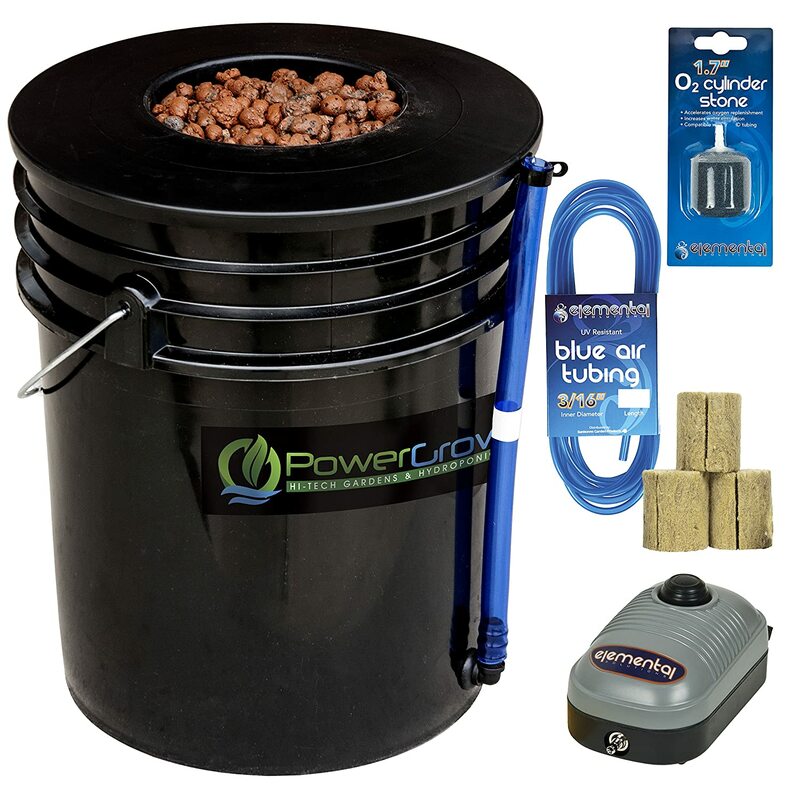 Aside from the lid and the bucket, it also comes with an air pump, tubing and stone, a medium for growing and starting plugs for Rockwool seeds. One cool feature of this kit is the blue indicator which shows the water level. This allows you to see how much water there is so you can refill as needed. Finally, it comes with a warranty from the USA manufacturers which is good for up to 12 months. This affordable kit comes with a bucket which can contain up to 5 gallons. It also comes with a basket lid and a drain for the bucket. Includes all the essential apparatus needed to start growing. This means that you won't have to spend more money on additional equipment. Comes with a controllable air pump. This permits you to manage the amount of air that enters the system. The air pump also created extra air and bubbles. This aids in restocking oxygen for your plants to grow well and flourish. The pump doesn't seem solid enough to support a 5-gallon system. Changing the water takes a lot of time.